It looks like Ant-Man is going to be the big thing this summer. The movie is getting good reviews – the LA Times called it, “Playful in unexpected ways and graced with a genuinely off-center sense of humor” – and it won the box office in its first weekend, bringing in about $60 million. All that means that Ant-Man collectibles and kitsch are going to be flooding the market. 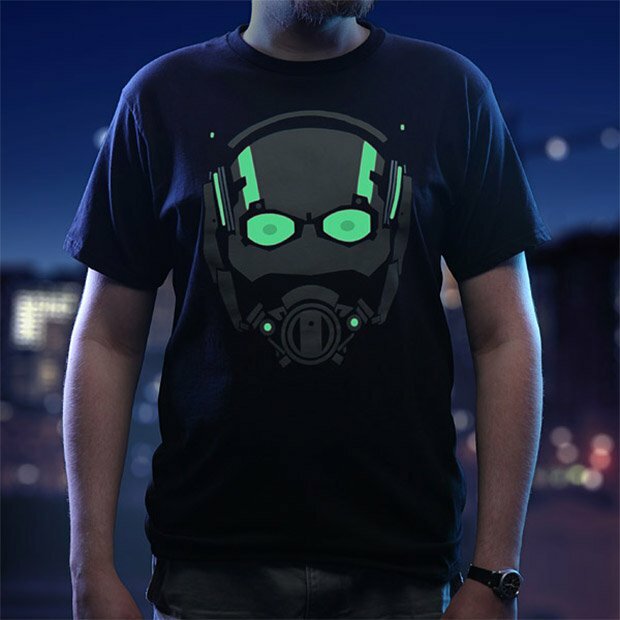 And if you want to stand out – and we mean that literally – from the throngs of fans then the exclusive Ant-Man glow in the dark T-shirt being offered over at ThinkGeek is for you. The 100% cotton tee features the tiny superhero’s gray and red helmet printed boldly on the front, but when you’re in the dark, the red accents disappear and glow an eerie green, complete with slightly darker, menacing pupils. For $19.99, it’s a great way to show your allegiance to the mighty mite. One piece of advice – if you buy the T, don’t wear it to the movie. The glow-in-the-dark aspect may annoy fans around you, and they might call the big bad usher with the flashlight to ask you to leave.